I am struggling to find recent sources on the carbon intensity of corn ethanol. I find many sources from around 2007, but I want something a little more recent (preferably from this decade). This is a difficult topic; land changes, production, transportation, refining, and end use all affect the carbon intensity of ethanol. 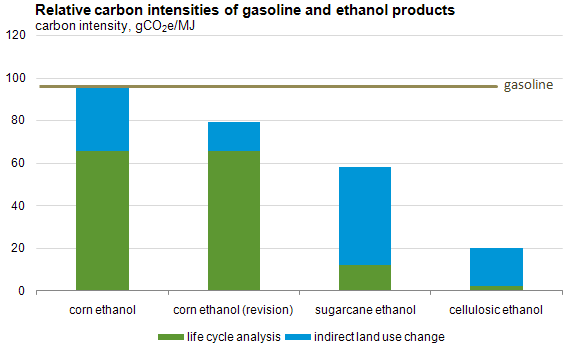 What is the carbon intensity of corn ethanol in the United States? the volume weighted carbon intensities (g CO2 e/MJ) of U.S. petroleum gasoline and corn ethanol over time based on the historical crude oil and ethanol plant resource mixes and future projections. The CI for corn ethanol reflects the most recent estimates of land use conversion from the University of Illinois and Argonne National Laboratory. However, there is no reference to these estimates, so I'm not sure from which year they are. Based on the table I suspect the most recent used data is from 2012. Not the answer you're looking for? Browse other questions tagged carbon-footprint biofuels or ask your own question.